This article is about a species of flowering plants called Japanese medlar. For other uses, see Medlar. For the band, see Loquat (band). The loquat (Eriobotrya japonica; from Cantonese Chinese: 盧橘; Jyutping: lou4gwat1) is a species of flowering plant in the family Rosaceae, a native to the cooler hill regions of China to south-central China. It is also quite common in Japan, Korea, hilly Regions of India (Himachal), Potohar and foothill regions of Pakistan and some can be found in some Northern part of the Philippines, and hill country in Sri Lanka. It can also be found in some southern European countries such as Cyprus, Malta, Italy, Spain and Portugal; and several Middle Eastern countries including Syria, Israel, Lebanon, and Turkey. Photinia japonica (Thunb.) Benth. & Hook. f. ex Asch. & Schweinf. It is a large evergreen shrub or tree, grown commercially for its yellow fruit, and also cultivated as an ornamental plant. Eriobotrya japonica was formerly thought to be closely related to the genus Mespilus, and is still sometimes known as the Japanese medlar. It is also known as Japanese plum and Chinese plum, also known as pipa in China. Eriobotrya japonica is a large evergreen shrub or small tree, with a rounded crown, short trunk and woolly new twigs. The tree can grow to 5–10 metres (16–33 ft) tall, but is often smaller, about 3–4 metres (10–13 ft). The fruit begins to ripen during Spring to Summer depending on the temperature in the area. The leaves are alternate, simple, 10–25 centimetres (4–10 in) long, dark green, tough and leathery in texture, with a serrated margin, and densely velvety-hairy below with thick yellow-brown pubescence; the young leaves are also densely pubescent above, but this soon rubs off. Loquat fruits, growing in clusters, are oval, rounded or pear-shaped, 3–5 centimetres (1–2 in) long, with a smooth or downy, yellow or orange, sometimes red-blushed skin. The succulent, tangy flesh is white, yellow or orange and sweet to subacid or acid, depending on the cultivar. Each fruit contains from one to ten ovules, with three to five being most common. A variable number of the ovules mature into large brown seeds (with different numbers of seeds appearing in each fruit on the same tree, usually between one and four). The fruits are the sweetest when soft and orange. The flavour is a mixture of peach, citrus and mild mango. Loquats and a Mountain Bird, by an anonymous Chinese artist of the Southern Song Dynasty (1127–1279). The loquat is originally from China (the Chinese name is pipa, cognate with the pipa instrument) where related species can be found growing in the wild. It was introduced into Japan and became naturalised there in very early times; it has been cultivated there for over 1,000 years. It has also become naturalised in Georgia, Armenia, Afghanistan, Australia, Azerbaijan, Bermuda, Chile, Kenya, India, Iran, Iraq, South Africa, the whole Mediterranean Basin, Pakistan, New Zealand, Réunion, Tonga, Central America, Mexico, South America and in warmer parts of the United States (Hawaii, California, Texas, Louisiana, Mississippi, Alabama, Florida, Georgia, and South Carolina). In Louisiana, many refer to loquats as "misbeliefs" and they grow in yards of homes. Chinese immigrants are presumed to have carried the loquat to Hawaii and California. It has been cultivated in Japan for about 1,000 years and presumably the fruits and seeds were brought back from China to Japan by the many Japanese scholars visiting and studying in China during the Tang Dynasty. The loquat was often mentioned in ancient Chinese literature, such as the poems of Li Bai. Eriobotrya japonica was first described in Europe by Carl Peter Thunberg, has Mespilus japonica in 1780, and was relocated to the genera Eriobotrya (εριο meaning wool and βοτρυών meaning cluster, in greek) by John Lindley, who published these changes in Transactions of the Linnean Society of London, 13(1), p. 102, 1821. However, the first record of the species might have been alluded to by the XVI century, in Portugal, since the common name for the fruit, nêspera (from the modified nespilus, originally mespilus, which referred to the medlar), is already used (José Pedro Machado, Dicionário Etimológico da Língua Portuguesa, 1967). Since the first contact of the Portuguese with the Japanese and Chinese dates also from the sixteenth century, it is possible that some were brought back to Europe, as was probably the case with other species like the hachiya persimmon variety. Curiously, the far more rare by now Mespilus Germanica, is now called "nespereira-europeia" to distinguish it from the common "nespereira" tree. The most common variety in Portugal is the late ripening Tanaka , where it is popular in gardens and backyards, but not commercially produced. In northern Portugal it is also popularly called magnório/magnólio, probably something to do with the french botanist Pierre Magnol. In Spain, the fruits are similarly called "nísperos" and are comercially explored, Spain being the largest producer worldwide, after China, with 41,487t annualy, half of which is destined to export markets. Over 800 loquat cultivars exist in Asia. Self-fertile variants include the 'Gold Nugget' and 'Mogi' cultivars. The loquat is easy to grow in subtropical to mild temperate climates where it is often primarily grown as an ornamental plant, especially for its sweet-scented flowers, and secondarily for its delicious fruit. The boldly textured foliage adds a tropical look to gardens, contrasting well with many other plants. 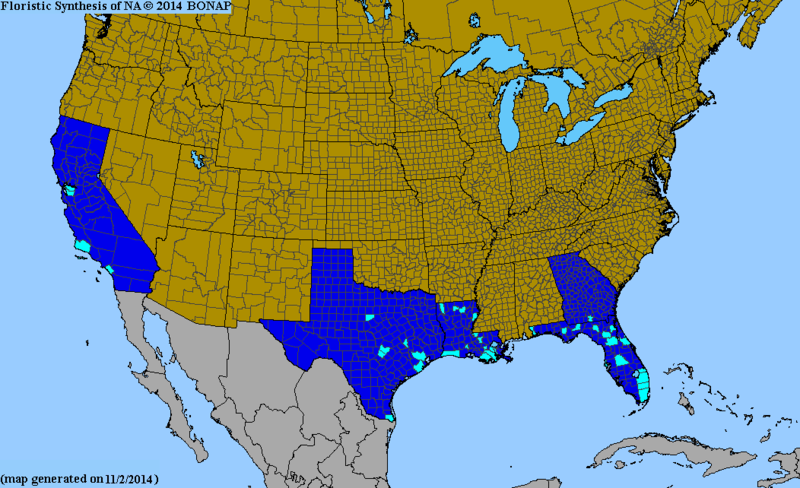 It is popular in the Eastern United States, as well as the American South. Loquat in flower. This is a cultivar intended for home-growing, where the flowers open gradually resulting in fruit also ripening gradually. There are many named cultivars, with orange or white flesh. Some cultivars are intended for home-growing, where the flowers open gradually, and thus the fruit also ripens gradually, compared to the commercially grown species where the flowers open almost simultaneously, and the whole tree's fruit also ripens together. Japan is the leading producer of loquats followed by Israel and then Brazil. In Europe, Spain is the main producer of loquat. In temperate climates it is grown as an ornamental with winter protection, as the fruits seldom ripen to an edible state. In the United Kingdom, it has gained the Royal Horticultural Society's Award of Garden Merit. In the US, the loquat tree is hardy only in USDA zones 8 and above, and will flower only where winter temperatures do not fall below 30 °F (−1 °C). In such areas, the tree flowers in autumn and the fruit ripens in late winter. The loquat has a high sugar, acid and pectin content. It is eaten as a fresh fruit and mixes well with other fruits in fresh fruit salads or fruit cups. The fruits are also commonly used to make jam, jelly and chutney, and are often served poached in light syrup. Firm, slightly immature fruits are best for making pies or tarts. The fruit is sometimes canned. The waste ratio is 30 percent or more, due to the seed size. The fruit is also processed into confections. Loquats can also be used to make light wine. It is fermented into a fruit wine, sometimes using just the crystal sugar and white liquor. In Italy nespolino liqueur is made from the seeds, reminiscent of nocino and amaretto, both prepared from nuts and apricot kernels. Both the loquat seeds and the apricot kernels contain cyanogenic glycosides, but the drinks are prepared from varieties that contain only small quantities (such as Mogi and Tanaka), so there is no risk of cyanide poisoning. The loquat is low in sodium and high in vitamin A, vitamin B6, dietary fiber, potassium, and manganese. Like most related plants, the seeds (pips) and young leaves of the plant are slightly poisonous, containing small amounts of cyanogenic glycosides (including amygdalin) which release cyanide when digested, though the low concentration and bitter flavour normally prevent enough being eaten to cause harm. The name loquat derives from lou4 gwat1, the Cantonese pronunciation of the classical Chinese: 蘆橘; pinyin: lújú, literally "black orange". The phrase "black orange" originally actually referred to unripened kumquats, which are dark green in color. But the name was mistaken as the loquat we know today by the ancient Chinese poet Su Shi when he was residing in southern China, and the mistake was widely taken up by the Cantonese region thereafter. In Armenian it is called "Nor Ashkhar" (նոր աշխարհ) which means New World because it ushers in Spring. In Turkish, it is named similarly, "Yeni Dunya" meaning New World. ^ "The Plant List: A Working List of All Plant Species". Retrieved 13 April 2014. ^ "Loquat Fact Sheet". UC Davis College of Agricultural & Environmental Sciences. ^ "Wozu lassen sich die Früchte der Mispel verarbeiten?". Edeka.de. Retrieved 19 July 2018. ^ "Japanese Plum / Loquat". University of Florida, Nassau County Extension, Horticulture. Retrieved 20 March 2012. ^ Linda M. Hunt; Nedal Hamdi Arar & Laurie L. Akana (2000). "Herbs, Prayer, and Insulin Use of Medical and Alternative Treatments by a Group of Mexican American Diabetes Patients". The Journal of Family Practice. 49 (3). ^ Davidse, G., M. Sousa Sánchez, S. Knapp & F. Chiang Cabrera. 2014. Saururaceae a Zygophyllaceae. 2(3): ined. In G. Davidse, M. Sousa Sánchez, S. Knapp & F. Chiang Cabrera (eds.) Flora Mesoamericana. Universidad Nacional Autónoma de México, México D.F..
^ "LOQUAT Fruit Facts". California Rare Fruit Growers, Inc. Retrieved 1 April 2017. ^ "Loquat". Hort.purdue.edu. Retrieved 8 May 2013. ^ "Loquat, production and market" (PDF). First international symposium on loquat. Zaragoza : CIHEAM Options Méditerranéennes. ^ a b Staub 2008, p. 133. ^ a b "LOQUAT Fruit Facts". Crfg.org. Retrieved 19 July 2018. ^ "Agroalimentación. El cultivo del Níspero". canales.hoy.es. Retrieved 19 July 2018. ^ "RHS Plant Selector Eriobotrya japonica (F) AGM / RHS Gardening". Apps.rhs.org.uk. Retrieved 8 May 2013. ^ "AGM Plants - Ornamental" (PDF). Royal Horticultural Society. July 2017. p. 36. Retrieved 17 February 2018. ^ California Rare Fruit Growers (1997). "Loquat". Retrieved 14 October 2014. ^ "World News - Eriobotrya_japonica". Cosplaxy.com. Retrieved 8 May 2013. ^ "Wolfram-Alpha: Making the world's knowledge computable". Wolframalpha.com. Retrieved 19 July 2018. ^ "Eriobotrya japonica Loquat, Japanese Loquat PFAF Plant Database". Pfaf.org. Retrieved 19 July 2018. Botanical and Horticultural Information on the Loquat (Traditional Chinese). Staub, Jack (2008). 75 Remarkable Fruits For Your Garden. Gibbs Smith. ISBN 978-1-4236-0881-3. Badenes M.L., Canyamas T., Llácer G., Martínez J., Romero C. & Soriano J.M. (2003) Genetic diversity in european collection of loquat (Eriobotrya japonica Lindl.). Acta horticulturae 620:169-174. 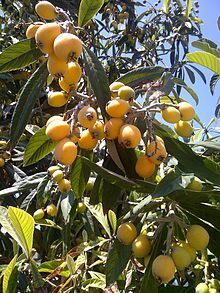 Look up loquat in Wiktionary, the free dictionary. Wikimedia Commons has media related to Loquat — Eriobotrya japonica.